The Obama administration has yet to agree to a request from human rights groups that President Obama meet with persecuted Chinese activists ahead of his Chinese counterpart’s state visit in Washington next week. Josh Earnest, the White House press secretary, confirmed on Tuesday that Obama will host Chinese President Xi Jinping for a state visit on Friday, Sept. 25. The meeting could provide some tense moments for the two leaders, who have found themselves increasingly at odds over issues such as China’s cyber attacks, human rights abuses, and militarization of manmade islands in the South China Sea. The "visit will present an opportunity to expand U.S.-China cooperation on a range of global, regional, and bilateral issues of mutual interest, while also enabling President Obama and President Xi to address areas of disagreement constructively," Earnest said in a statement. In a letter last week, a coalition of rights groups led by Human Rights Watch urged President Obama to invite Chinese lawyers, writers, activists, and religious leaders to the White House before Xi’s visit. Such a move would help the Obama administration "stand with civil society against Beijing’s repression," the groups said, including constant threats of "arbitrary detention, torture, harassment of family members, and being disappeared." "The Chinese government under President Xi has launched an assault against this community with a ferocity unseen in the past two decades, perceiving and treating them and their efforts as fundamental threats to the state," they wrote. 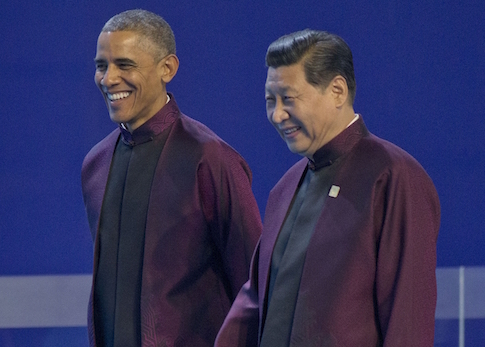 The White House declined to comment on whether Obama would meet with activists before Xi’s visit. Other rights groups and dissidents have called on Obama to cancel Xi’s visit unless imprisoned lawyers and activists are released and the conditions for Chinese civil society improve. As part of a Communist Party crackdown that began in July, more than 300 human rights lawyers and activists were interrogated or harassed by authorities. Most were released, but 23 are still in detention, according to Chinese Human Rights Defenders (CHRD). Several are being held at unknown locations. Rights groups say the treatment of Chinese dissidents will likely worsen under a campaign by Xi to tighten the Party’s control of society, including laws or proposed legislation on state security, counterterrorism, and cyber security. The Chinese government has also pledged to regulate non-government organizations that receive foreign funding and assist domestic activists, an initiative that could force many to close. Chinese lawyers and activists have sharply criticized Obama for what they say is his unwillingness to publicly raise the cases of political prisoners with his Chinese counterparts. Liu Shihui, a human rights lawyer based in Guangdong Province that has previously been detained and had his law license revoked, wrote on Wednesday that amid the Party’s "campaign to suppress, crackdown, and annihilate those who fight for a liberal democratic society," Obama has "been too accommodating." "The United States is the lighthouse of freedom and democracy for the world, but under the Obama administration it has been too accommodating, even appeasing, to the regimes that act like rogues and hoodlums in the international community," he wrote on ChinaChange.org. "Almost the entire Western free world, including America, has been led by the nose by the Communist Party’s checkbook diplomacy." "I recommend that in conducting great power diplomacy, the Obama government again takes up the cause of freedom and democracy, looks far ahead into the future, and doesn’t allow the glittery promises of wealth from a dictatorship to muddle your priorities," he added. Some rights groups also assailed the Obama administration after it decided not to invite Cuban dissidents to the reopening of the U.S. embassy in Havana last month. Secretary of State John Kerry reportedly met with activists later that day in the Cuban capital. China’s human rights record is just one of several issues that is expected to be raised at the meeting between Obama and Xi. Recent satellite images suggest that Beijing has continued construction on the Spratly Islands in the South China Sea, including military runways and surveillance towers, despite claims that it had finished such work. U.S. officials say China’s establishment of military facilities in disputed waters makes a regional conflict more likely. While there have been some reports that the administration is considering "unprecedented economic sanctions" against Chinese companies and individuals involved in the hacking of U.S. trade secrets, U.S. officials now say that that the imposition of any sanctions is unlikely before Xi’s visit.